Nanoparticles are the latest rage in acne care products. They are a hot selling point for cosmetics, too. A nanoparticle is not just a tiny particle. Lots of acne care products contain “micronized” particles of their active ingredients, such as benzoyl peroxide for fighting acne bacteria or titanium dioxide for sun protection. A micronized ingredient is just an ingredient that has been milled, or ground, more than once. The particles are still large enough to see with the naked eye if you look closely enough. Nanoparticles of zinc oxide can aggregate under the skin and form permanent white spots in the skin. A nanoparticle, however, is a particle that is too small to be seen with the naked eye. The “nano-” epithet in the name refers to its size in nanometers, or billionths of a meter. Most nanoparticles have a diameter of 1 to 100 nanometers, or from about 4 hundred-millionths of an inch wide to about 4 millionths of an inch wide. A nanoparticle is so small that that it doesn’t pick up a static charge, and it can’t be removed by white blood cells if it gets inside the body. Many acne products that claim to use nanoparticle technology are actually just micronized, and they don’t pose a danger if inhaled or swallowed or absorbed into the bloodstream. But acne products that use real nanoparticles pose a real risk of unintended side effects. What Kinds Of Skin Care Products Contain Nanoparticles? Makers of sunscreens are poised to use zinc oxide and titanium dioxide nanoparticles in nearly all mineral formulas for sun protection. If you have acne, chances are you need sun block. As pimples heal, the skin uses a brown pigment called melanin as an antioxidant to stop inflammation. Once the pimple is gone, the brown pigment remains. Since melanin also protects against sunburn and sun damage to the skin, sunblock keeps the skin from spotting after acne heals. Zinc oxide and titanium dioxide are great ingredients for sunblock. First of all, from the manufacturer’s perspective, they are cheap. As they are traditionally used, they are non-toxic. They block UV-A, UV-B, and UV-C rays of the sun, offering much better skin protection than non-mineral sunscreen ingredients. The problem with zinc oxide and titanium oxide is, as you may have noticed from observing lifeguards who use these products on their noses, is that they are white. Particles of zinc oxide and titanium dioxide cling to the skin. That’s fine if you have fair skin, but it’s really noticeable if you have dark brown or black skin. The net effect of white sunblock on black skin is usually purple. And even though people who have dark skin don’t sunburn as easily as people who have fair skin, they tend to have worse problems with skin discoloration after they have acne. Zinc oxide and titanium dioxide in nanoparticle don’t leave a white shadow or a purple tint on dark skin. And it’s well known that they aren’t poisonous. So what’s the downside of nanoparticles in sunscreens and other acne treatments? The major issue with zinc oxide nanoparticles is that they are too potently antimicrobial. The ability to fight bacteria would seem like a good thing. 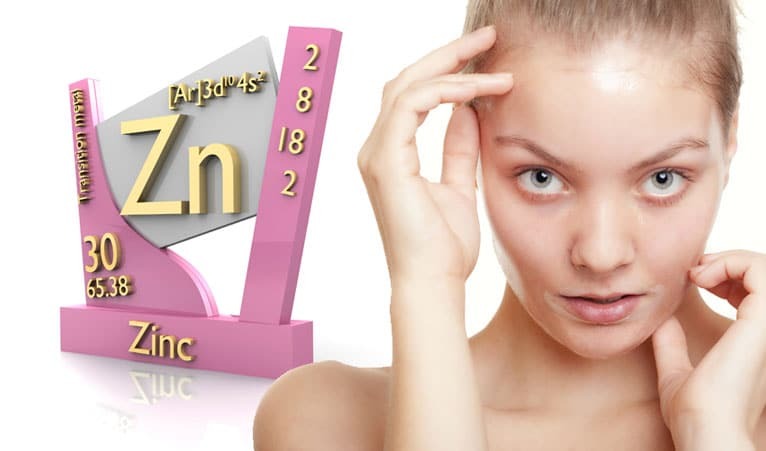 After all, zinc fights acne bacteria. The problem is that zinc oxide nanoparticles also kill useful bacteria on the face, and when they are rinsed off during swimming or in the shower, they get into the water supply and kill the plankton and algae that feed fish. The problem is serious enough that one country in the European Union, Sweden, has banned sunscreens that contain these ingredients. No US government body restricts the use of nanoparticles in sunscreens or other skin products, but manufacturers in the United States are voluntarily not using them until environmental studies have been completed. But nanoparticles may also have adverse effects on the human body. Nanoparticles smaller than 13 nanometers in diameter are absorbed through the skin. They don’t get very far, just to the lower layers of the skin. Once nanoparticles are absorbed, however, they tend to form clumps. Nanoparticles of zinc oxide and titanium oxide can aggregate under the skin and form permanent white spots in the skin, particularly noticeable in darker skin. The innovation in skin care that prevents temporary changes in the color of dark skin may have the side effect of permanent changes in the color of dark skin. A Safe Way To Use Nanoparticles In Skin Care? Nanoparticle technology is just too promising for skin care product manufacturers to abandon it without a fight. The next generation of nanoparticle technology may combine nanoparticles with liposomes to make them skin-safe and environmentally friendly. A liposome is a hollow sphere, far too small to be seen without a microscope, made of a natural material called phosphatidylcholine. This is the substance that makes up most of the membrane surrounding a cell. Many vitamin and herb products use liposome technology so their active ingredients are more quickly and more completely absorbed. Phosphatidylcholine liposomes are resistant to water and stick to the surface of the skin. They hold nanoparticles tight inside them so they cannot migrate into the skin and into the bloodstream. They don’t dissolve in water and are not likely to pose a threat to the environment. Cosmetics experts believe that nanoparticles in liposomes could make safe sunscreens for all skin types, but nanoparticle technology alone is not enough. If you live in Canada, Australia, or most of Europe, you may find sun blocks and acne care products that are labeled with the term “nano” on the package. If you have Brown, Asian, or African skin, don’t use them. They may cause permanent changes in the pigmentation of your skin. Wait for the next generation of skin care products made with nanoparticles in phosphatidylcholine liposomes before you use any kind of zinc oxide or titanium dioxide on your skin. And if you see a product advertising that it contains “nanoparticles” of benzoyl peroxide for treating acne, don’t believe it. All of these products are actually just finely ground, but not to nanoparticle size. Extended-release benzoyl peroxide, however, may allow you to use a much lower dosage that works for a much longer time with far less irritation to your skin. Should You Buy Acne Care Products From Your Dermatologist? Sunscreen and Acne: What’s the Connection?